The Fantiscritti marble quarry is where Michelangelo spent months selecting the marble he'd use. The David marble slab came from this quarry, though it was selected by someone else decades earlier and later discarded as useless until Michelangelo decided otherwise. 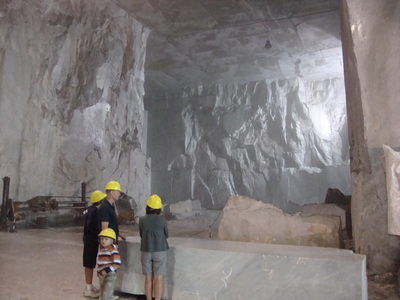 These marble quarries very near Lucca look, from a distance, like snow-capped mountains. With its scenic landscape immersed in white marble, this is a truly unique location. You can take a guided tour which lasts for about 30 minutes. 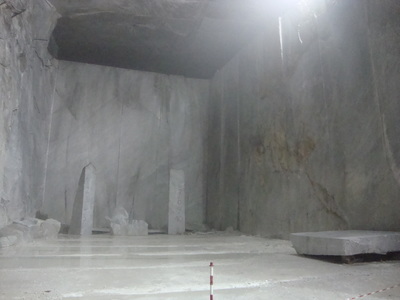 Once inside the Ravaccione Quarry, you will be talked through the processes of cutting and pulling of the marble blocks. This quarry is known as the MARBLE CATHEDERAL due to its vast and cavernous rooms. In the James Bond film “QUANTUM OF SOLACE" scenes were filmed in and around the mountains of Carrara, including the scene where 007’s Aston Martin DBS crashes in to a marble quarry. The marble workers put excavations on hold for a day whilst the Bond crew deliberately wrecked some vehicles. The car manufacturer Maserati used the quarry as a backdrop for the unveiling of a new car. The design Napapjri even held a fashion show here with catwalk models parading down the blocks of marble. Car manufacturers. Lamborghini, have also used the quarry for exhibitions. The quarry is also used by artists/sculptors to exhibit their works.